The madness continues on. So far 2014 has been the busiest year I've had in many years. Not that I'm complaining. A lot of games have come and a few have gone. I just haven't been able to keep up with web updates. Now, however, all projects are currently finished, including the Galaga you see here. I have finished several more, and they will get dedicated space on the site when time permits. For now I was able to manage to shoot some updated photos as well as a new video of the current lineup. Visit the My Games page to check these out. Can you spot all of the newcomers? On another note, I must announce that this may be the final update for 2014. However the reason is something I am very excited about. You may recall that I mentioned listing our home for sale. Today I received the good news that we just entered into a sale contract. So with that said, "The Cave" is on the move. We have our eye's on a couple of new homes in particular, both of which have at least a partially finished space to house the collection. Once we get settled in I will be able to focus on web updates once again. Until then, enjoy the new images, and happy gaming! 7/13 - Long time, tons of updates, where have I been? Between working long hours and other things (including listing our house for sale) I simply don't have as much time to devote to keeping this site updated as I would like. My apologies. So this time I'm going to attempt to cram a ton of updates in a single post. Yes, these games still keep me busy too. A lot has changed in the last few months. Some games have come and gone, a few have been sold from my collection and, of course, some newcomers have arrived. You may recognize the Revenge of Doh game you see here from my last posting. We had planned to flip this game but it really grew on Alli and myself. So we decided to keep this one and give it a little face lift, which included a monitor swap and new artwork for the monitor bezel. I will work on a dedicated page for this game soon, along with a few other keepers, when time permits. Games sold from my collection: Satans Hollow & Video Pinball. Games that have come & gone in the past several months: Arkanoid, Ice Cold Beer, Paddle-Ball, Hang-On, Krazy Bowl (Joust 2 cabinet), Area 51 Maximum Force Duo, Moon Cresta, Championship Sprint (yes, another one), Omega Race Cockpit (empty), Buster Bros. (Robotron cabinet), Police Trainer 2 (partially gutted). Newcomers: Arkanoid 2 (as mentioned), Area 51 Site 4, Dig Dug & Galaga. Yep, it's been crazy. 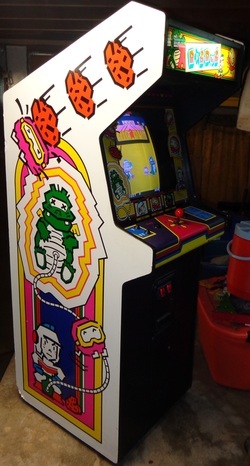 Here is a picture of Dig Dug which is in fantastic shape. Galaga is turning out to be quite the project. You won't want to miss updates whenever I can get them posted. Another game I recently picked up recently is a very nice Ms. Pac-Man cocktail game. 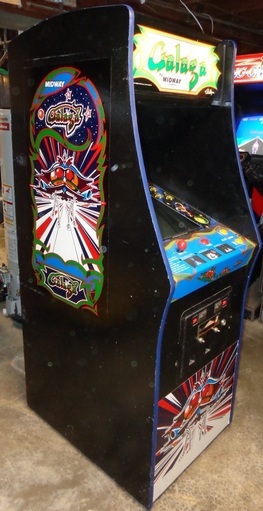 Since I already own a Pac-Man upright, this one is available for sale, along with a few other games and numerous parts I have amassed recently. With all these changes, I have made a few changes to the site as well. You may notice the "wanted" page has been removed from the navigation menu. This is because I have replaced it with a new "Marketplace" page. This new page contains a list of all items available for sale or trade, including arcade games & parts. My list of wanted items have been merged into the marketplace as well. Be sure to check it out. Who knows, maybe I have something you've been looking for. Let's do some trading. I have also updated the "My Games" page. It now includes "old friends", just a few of the games that have come and gone over the years. You may recognize many of these games, but there are also several which never got a page on the site. Well, I've got to get to work on this Galaga. Be sure to check back later for more updates as well as new pages for the new games in my collection. Happy gaming. This started with the typical story of scanning Craigslist for potential bargains. Since I live in the middle of Missouri, I generally check 3 cities in particular. Columbia, which is near my home, and the two major cities of KC & Saint Louis. Although the Lake of the Ozarks area is not too far from home, I rarely focus on that area. In my experience, there's never much listed there. Furthermore it's a resort region. Mostly upper class live there, so on the rare occasion when a game is listed, it's usually insanely priced. Well on this particular Sunday I was bored and had no plans, especially considering I had just come home from a Saint Louis Blues hockey game the evening before. Well this time there was not just one, but two recent listings in the lake area that I simply couldn't ignore. The first was for 3 games in Sunrise Beach. This consisted of an Arkanoid, Arkanoid 2 "Revenge of Doh" and a highly desirable mechanical game called Ice Cold Beer. 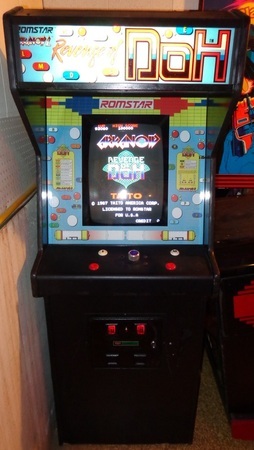 The Arkanoid 2 game was listed as working and the others were in unknown condition. These were listed at $200 for the entire lot. I immediately wanted them, as I enjoy working on these games, and they would be good candidates to fix & flip. Particularly the Ice Cold Beer machine, which can fetch up to a grand in the proper condition. The second ad was listed as a warehouse full of games in Eldon. There weren't many specifics listed other than this was a 2-day sale and games were starting around $25. This was perhaps a strange coincidence, as a Super Auction was scheduled for Eldon just the following weekend. I called the number listed and quickly learned that, in fact, this was the same warehouse where next weekend's auction was being held. As a matter of fact, I was talking with one of the main set-up guy's for Super Auctions. Turns out they had a massive amount of inventory and needed to make room for more on the way. Time was running short for these guys and so they decided to try to sale off some stuff early to make room for new arrivals. Afterwards we just had to stop in Eldon. I mean, it's on the way home and it's a warehouse full of potential bargains. Did you really think I was going to stop at just 3 games? We stop by and immediately notice a warehouse full of junk. I couldn't help but notice many pieces that were left over from the previous auction in Saint Louis. Most of the other pieces were just a mess, many of which had evidence of mice living in them at one time or another. The only game I had a mild interest in was a Hang-On mini. Only reason being that I remember this one from the last auction. It was a working game with a minor steering problem. This must have scared the bidders away since it was passed on at that auction and now it's back for round 2. I already own a Hang-On but I knew this would be an easy fix & flip. I planned on making a lowball offer just to see if I could take it home. Then Alli found something that I was very surprised to see her showing an interest in. It was an old Pong clone called Paddle-Ball. She said she never played Pong. Now I have a closet full of home Pong consoles. Mainly because I find them for next to nothing. In my experience, the arcade Pong clones never fetch much either. Unless you have an original Atari Pong game, the clones just don't get any love. However I saw the potential. Aside from a broken plug, this game was complete and in decent shape. Furthermore of all the clones I've come across over the years, this one actually resembles an original Pong game. I made an offer of $75 for both the Hang-On mini and the Paddle-Ball. They came back at $100. This was a good deal in my opinion, but I knew they were looking to unload and I could certainly make room for another game. So I ask if they would throw in a junk game. After some more haggling they agree. I didn't have any particular game in mind, so I decided to just pick out anything that I knew worked, at least somewhat. I noticed a Krazy Bowl in a Joust 2 cabinet. It even still had a Joust 2 marquee on it. I remembered this game from the previous auction and knew it was rough, but it was a working game with a decent monitor. I figure between that and the power supply I was definitely getting my money's worth. The deal was made and now a 3 game pickup turned into 6. Arkanoid: Works. Missing monitor glass. Needs new plexi on the control panel. Arkanoid 2: Works. Heavy burn on the monitor from another game. Will need replacement. Ice Cold Beer: Boards working. Belts broken. Missing front glass & ball. Base damaged. Hang-On mini: Works. Needed minor adjustment to steering potentiometer. Paddle-Ball: Works. Needed new power cord & monitor adjustment. Krazy Bowl: Works. Trackball needs cleaning. Broken monitor plexi (wrong cabinet for this type of panel). Stay tuned for more updates on this epic haul. I'll go over repairs and future plans for these games as well as a trade that was already made for at least one of these games. Click on image to visit Space Invaders page. ...a tale of two invaders? What does that mean? 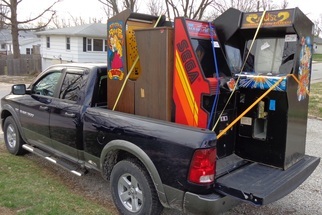 Well, it's the story of how I took two Space Invaders arcade games in various states to create one awesome game for my collection. This is the result of my latest Super Auction score just before Christmas. This auction was just absolutely nuts. Even though I had plans with family on auction day that didn't stop me from eagerly bidding on this game. It was mostly working but did have a few quirks. Luckily I was able to talk an auctioneer into a good price on another one in dead row which previously had been passed on later that evening. Hence, a tale of two invaders. It wasn't long before I put together a really nice game out of the pair. Whats more? This game has a multikit installed as well. Click image to visit Pin-Bot page. Yes you read that right, another pinball. As a lad I thoroughly enjoyed playing Pin-Bot.... on the NES. 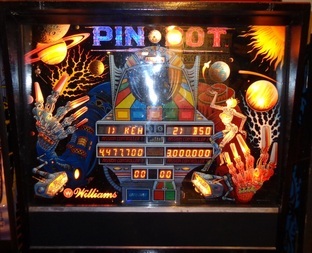 Back then I had no idea it was a real pinball game, let alone one that I would actually own some 25 years later. This one recently showed up on Craigslist not far from home. Less than a half hour away in fact. It was one of three games the seller had listed, but this one was the silver tuna for me. Alli was also with me during the preview and immediately took a shine to it. Between that and the nostalgia I have for this game, I simply had to bring it home. Now, about a month and a half later, it's finally shopped out and gracing the lineup in pinball row. Click here to read all about it. By the way, this is one of two recent pickups. Yes, another game. What is it? Stay tuned. Click here to visit 2013 Archives.